From weddings and birthday parties to holidays and anniversaries, life is full of special occasions. Remembering them is important, that’s why we’ve created this guide to what photo book you should create for each occasion. We’ve included insider tips that you might not have thought of as well as advice on the size, format and cover. All you need to do is take the photos. For lots of people, their wedding is the most important day of their life so it makes sense to show it off in the best way you can. Creating a photo book full of moments from your big day is a great way to remember it and will also make a wonderful gift for friends and family. Feeling inspired? Take a look at our wedding photo book ideas. If any day calls of the biggest photo book, it’s your wedding day. Choose an XL square so there’s plenty of space for showing off your photos. Layflat pages will mean you can print group photos across two pages. It will also mean you can leave it lying open on your coffee table for people to browse. Choose glossy pages too for a luxurious finish. Choose a photo cover and use a favourite photo from the day. Perhaps a photo of the bride and groom or one of some details like the wedding rings. For the more minimal bride choose a silver or beige linen cover. We have over 100 wedding-themed clip arts, backgrounds and masks for you to choose from. From graphic shapes to whimsical sketches. Don’t just use photographs. Scan in your wedding invitation, seating plan, dinner menu, thank you cards and anything else you can think of that can be scanned and include it in your photo book. For more tips read our how to scan your photos blog post. 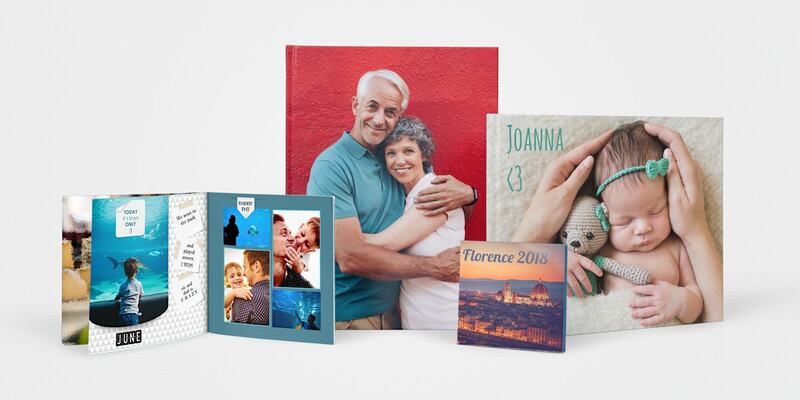 Whether it’s one year together and you’re celebrating your paper wedding anniversary or it’s been 60 years and you’re celebrating your diamond wedding anniversary, a photo book full of moments together is a lovely way to mark the occasion. 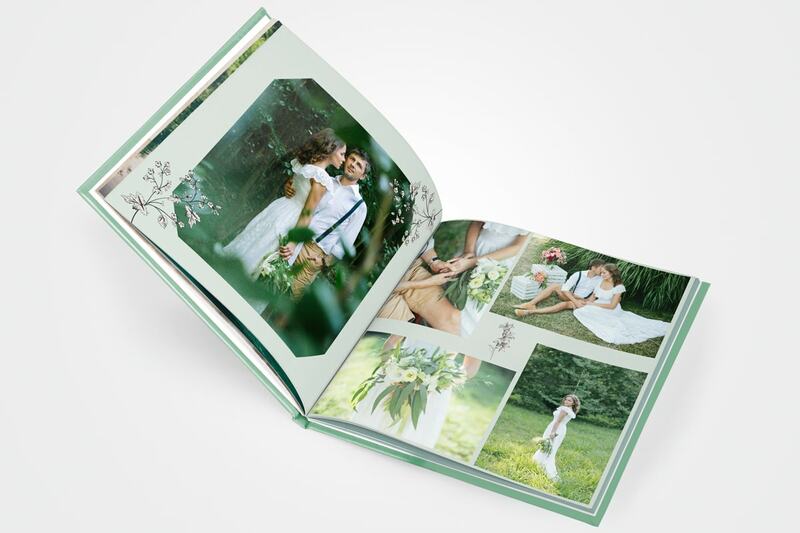 Choose an L portrait book as it’s perfect for photos of the happy couple. 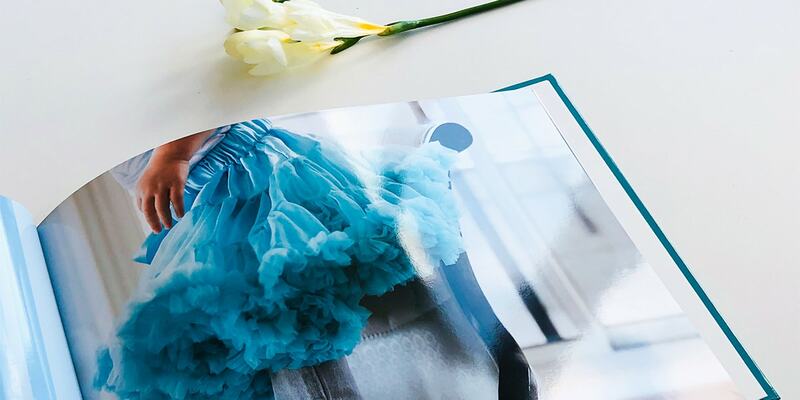 Go for glossy pages to give your photos a beautiful depth of colour. 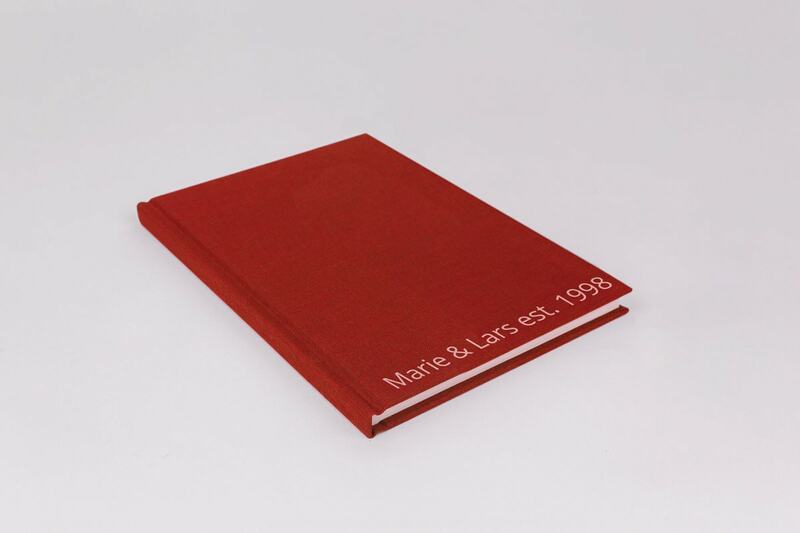 We love our linen cover in striking red for anniversaries. You can print the date on the cover too. 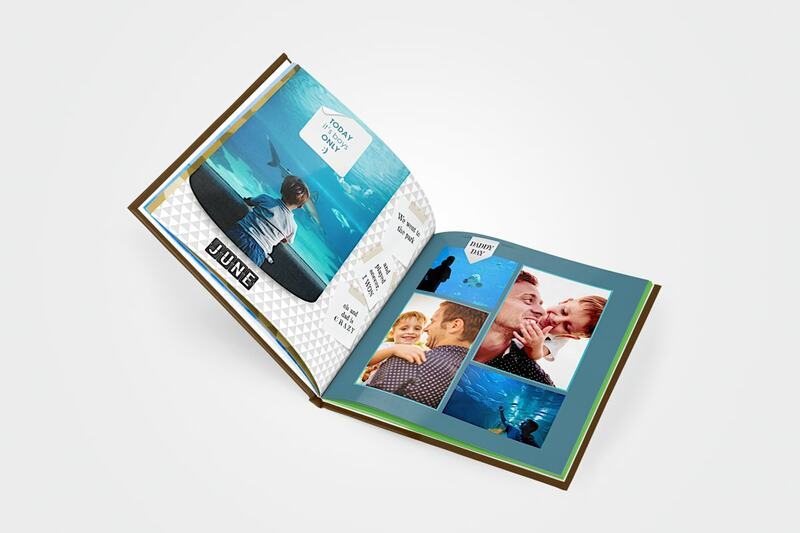 In our creator tool you will find over 80 love-themed clip art and borders that will give your photo book a creative edge. Why not use photos right from the day you met up until the present day? Include special occasions like your first photo together and your wedding. 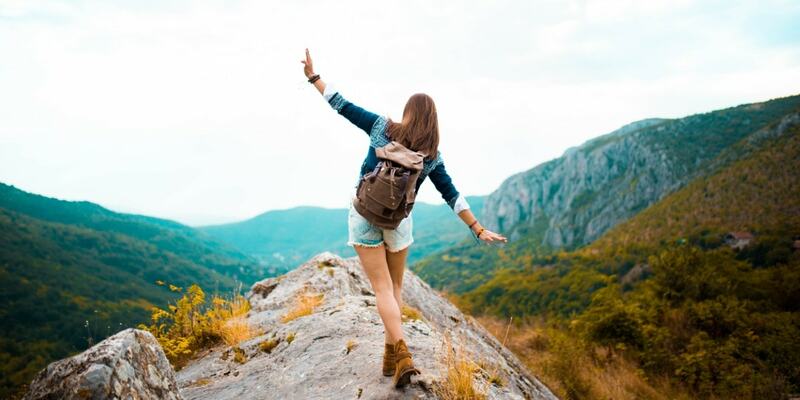 From two-week camping trips to month-long holidays in far-flung corners of the globe, photo books of your travels are better than any souvenir you can buy. You’ll want to show off all your amazing photos at their best so go for an XL landscape. Layflat pages will mean you can print landscape photos without interruption across two pages. Perfect for those panoramic shots. Also take advantage of all the extra pages you can have. You can get up to 96 extra pages so you have space to feature all the photos you like. Go for a family photo in a special place and include the year and place you travelled to. 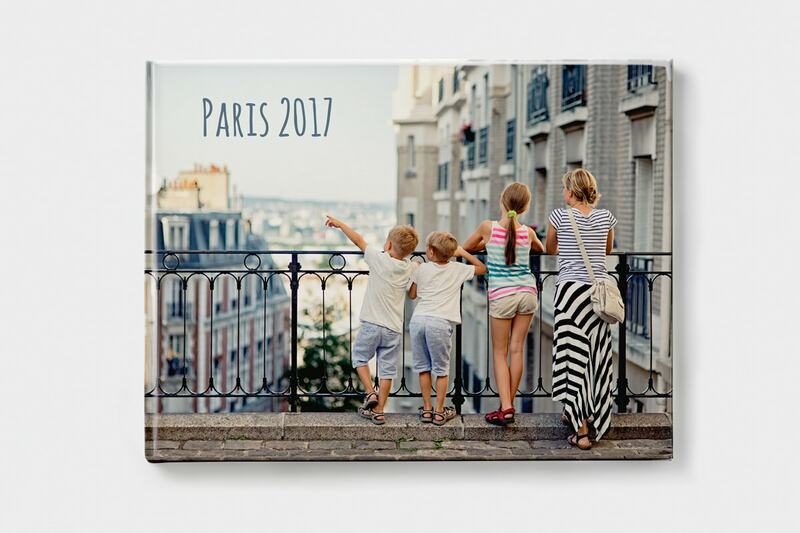 We’ve got lots of travel-themed clip art that will make your photo book look even better. From the beach to the mountains and the sun to the snow, there will be something to suit your book. 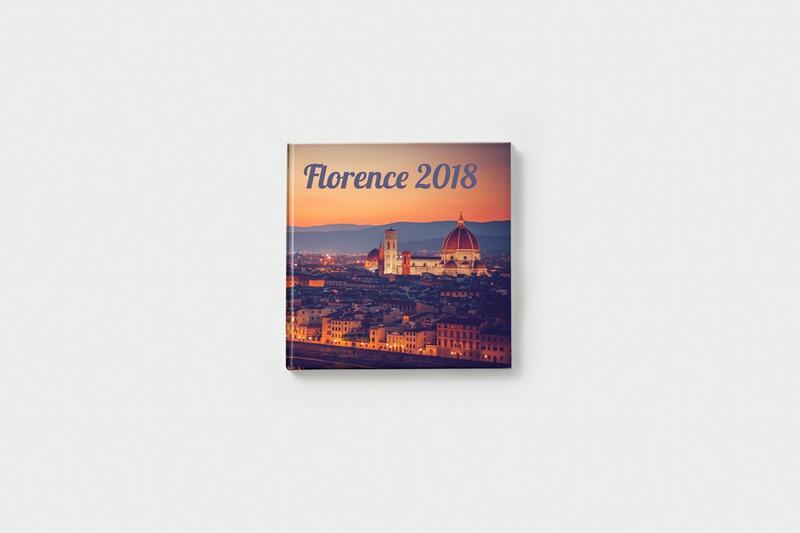 Include the year and place of travel on the spine of your photo book to display in your home. Whether you’re spending a weekend in the country or a few days exploring a new city, be sure to take your camera and get some photos. Not sure what to take photos of? We’ve got some urban photography tips on the blog. And we’ve even created a photo book from a city trip to London to help inspire you. You probably won’t take that many photos over a few days so go for M square photo book. Choose your favourite selfie from your mini adventure and put it on a photo cover. From Rome to London, we have lots of city-themed clip art. You can also add a map of the place that you visit as a background in your book. Dedicate a spread or page to typical food of the place you visit. The first few days, weeks and months of a baby’s life are some of the most precious. There will be lots of exciting changes to document and photos are the best way to do it. A photo book full of baby photos will be something you’ll look back on for years and years. Read our blog post about creating a baby photo book for more tips and creative ideas. If you have taken some professional photographs you’ll want to show them off. That’s why we think an L landscape is perfect. Choose layflat pages for your book so that you can print a spread of the baby without a crease in the page. If you have a favourite photo of your little one, use it on the cover. You’ll love looking at it when it’s on the table. We have lots of baby clip art that are ideal for adding to your photo book. Think toys, cute animals and fun little doodles. To really document the changes in your baby, take a photo of them every week. You could then print all of the photos side by side to show them growing up. It’s not every day that all the family get together, so when they do it’s a great excuse to photograph it and create a photo book. If you’re not sure of the best way to take photos of everyone, read our group photo tips for some inspiration. 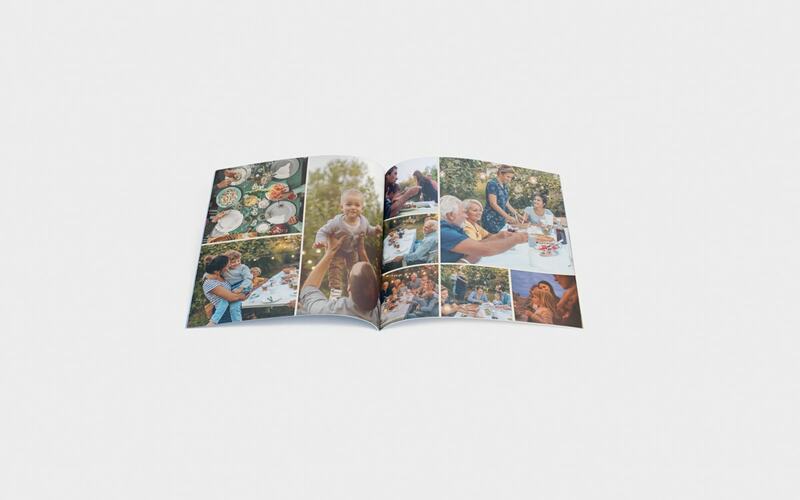 An M square photo book is the perfect format for a family reunion. Not too big, not too small. Choose a soft photo cover of the whole family together. Printing it on soft cover means it’s super light and you can post a copy to all of your relatives. Use our beautiful letter clip art to write the family name in the photo book. Send an email round to everyone who attended the reunion and ask them to send any photos they took. You can then include them all! A lot can happen in a year and making a photo book is a great way to document it all. It will likely include photos from lots of different events and milestones as well as little moments that you might otherwise forget. 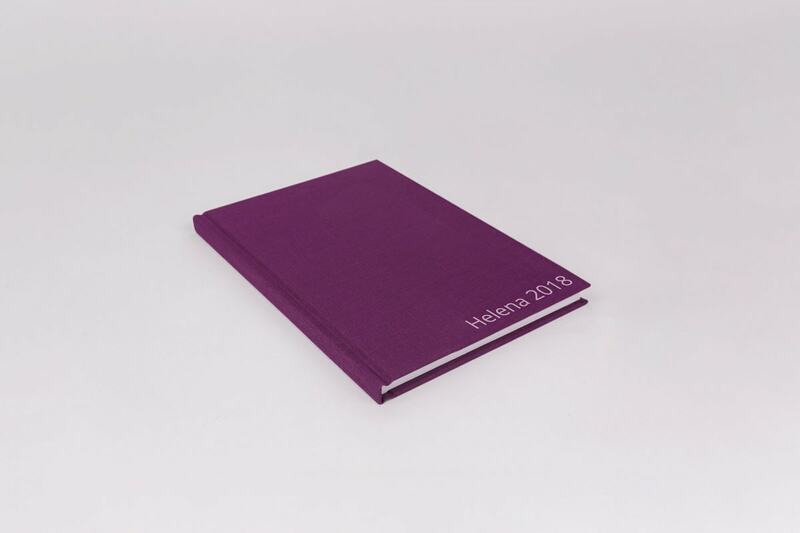 We’ve got lots more creative year book ideas on the blog. 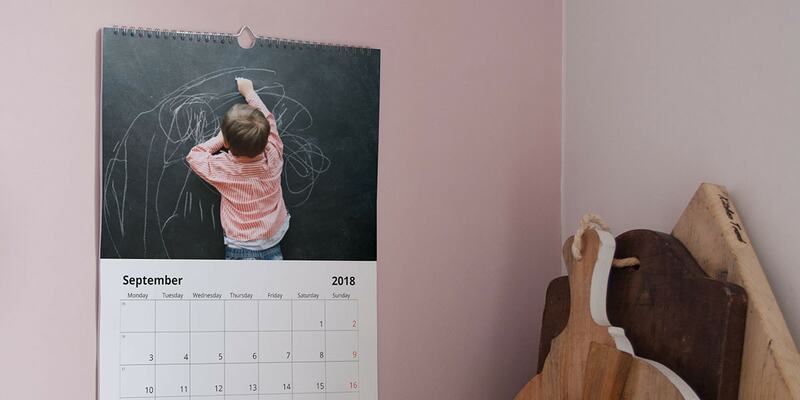 Go for an L square book so there’s plenty of space for photos from every month of the year. We think a leather cover with the year stamped on it is perfect. Then you can carry on the tradition, making one every year and display them all together on a shelf. We have a whole load of year book-themed clip art for you to choose from including lots of typographical ones with the month of the year. If you have lots of photos, a good time-saving option is out auto layouts feature. It will automatically lay out your book for you. You can find out how to use it in our auto layout blog post. There will be cake, chaos and a whole lot of fun. Kids birthday parties will throw up lots of cute photo opportunities so have your camera ready. 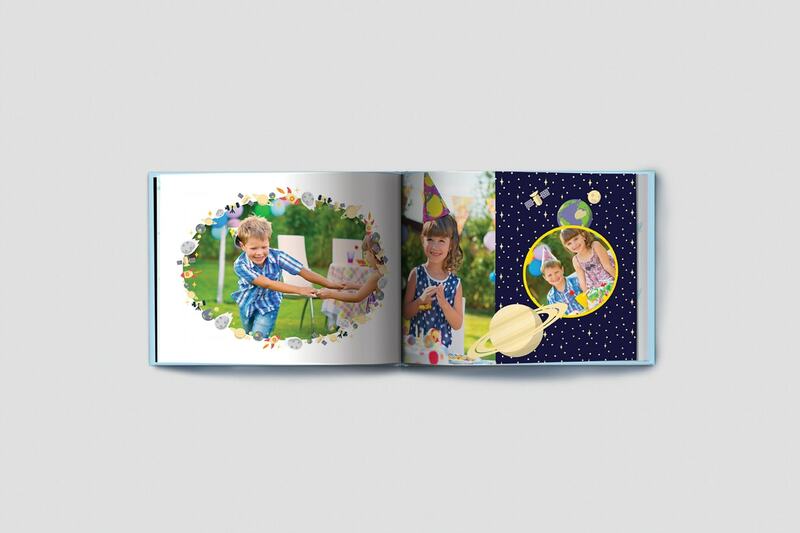 Read our blog post on how to create a kids birthday photo book for more ideas. Choose an M landscape – one of our most popular formats and perfect for a birthday party. We think a soft photo cover of the birthday boy or girl blowing out their candles will look great. From dinosaurs and ducks to whales and party hats, there’s so much clipart to choose from for your kids birthday book. Take photos of the little details like the table settings, decorations and the cake before the kids run riot and make a mess of everything. Print photographs from their special day in a photo book and hand a copy to close friends and family. There will be lots of opportunities for portrait photographs during the communion itself so we recommend you choose an M portrait photo book to show off the photos at their best. Choose a linen cover and then print their name and the date of the communion on it. Keep the communion certificate and scan it into the book. A lovely reminder of the meaning of the day. We hope that this guide will help you when you’re choosing what photo book to make for your special occasion.Once you’ve created it share a photo on Instagram and use the #bonusprint hashtag so we can see what you’ve been up to. You could also inspire friends and family by sharing this blog on social media using the icons below.